When I pictured what OmniFocus 2 for the iPhone would look like on iOS 7, I pictured simplified monotone icons in a table-view structure that the app has had since it was first released. The reason is probably because when I think of OmniFocus I think of powerful and quality software, however a bold interface is not a characteristic that would ever come to mind. When I opened OmniFocus 2 for the first time, I was shocked. Not to sound dramatic -- I did not fall out of my chair -- but it honestly took me a few seconds to absorb what I was looking at. OmniFocus 2 is a bold redesign. The Omni Group could have played it safe but instead they dove head first into creating an app from the ground-up that is fully assimilated to the new iOS 7 way of life. The most notable change is the general layout. The table-view and the tab bar have been replaced with a clean collection of bright colorful sections of the interface for each of the major features. A pull-down menu was added at the top that consists of Sync, Settings, and Search. The pull-down menu persists throughout the app and provides quick access to a search bar regardless of how far down you have drilled in to your tasks. At a quick glance you see how many tasks you have in your Forecast, Flagged, or sitting in your Inbox. In addition, there is a new floating button in the bottom right corner to add a new task from anywhere in the app. Although the functionality was there in the previous version, this floating button is an excellent replacement now that the task bar is gone. Navigation is also greatly improved: with each tap of the user interface, you are greeted with smooth animations that transition you from one view to the next. It feels very polished. 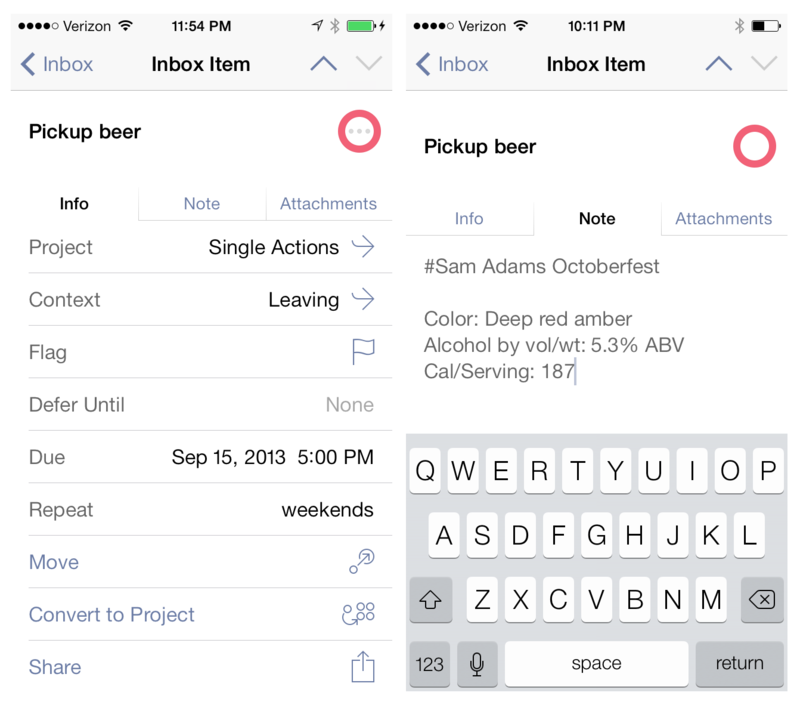 One of the major improvements to OmniFocus 2 is the ability to sync your tasks in the background. This was my only qualm with the previous version, which was more of an operating system limitation than a fault of the app. Any time the previous version of OmniFocus would reload the app with updates it had recieved from the server, it would obstruct the user interface until the refresh was complete. This is no longer the case in version 2 and it can even update when the app is not active. I think we will see a lot of apps make use of this new API and I'm happy to see the Omni Group jumping on board with implementing it. The redesigned Home screen icon looks great. It may not be important to some, but I feel it is worth noting when an app goes through a major revision. The Omni Group maintained the original styling and textures yet modified it to perfectly blend with the iOS 7 color palette. The brighter purple gradient on the icon looks right at home in my dock. One feature I was really hoping to see was the ablitity to quickly access actions on tasks and projects right from the list view. I was hoping for some options that would be accessed by a long tap on either a project name or task name without having to go into the details view on that project/task. Something similar to the action menu that shows up below a tweet in Tweetbot or even a simple pop-over with perhaps complete or defer actions available. I think quicker actions would make OmniFocus even more usable but, as it stands, version 2 is a great update. I have been using iOS 7 since beta 1 and I am not entirely sold on the new direction, but, like the rest of you , I am along for the ride. I am keeping an open mind about the lack of contrast, the borderless buttons, and teenage pop-star color scheme. I think the Omni Group did an excellent job improving on an already great product while keeping it relevant on an entirely new operating system. 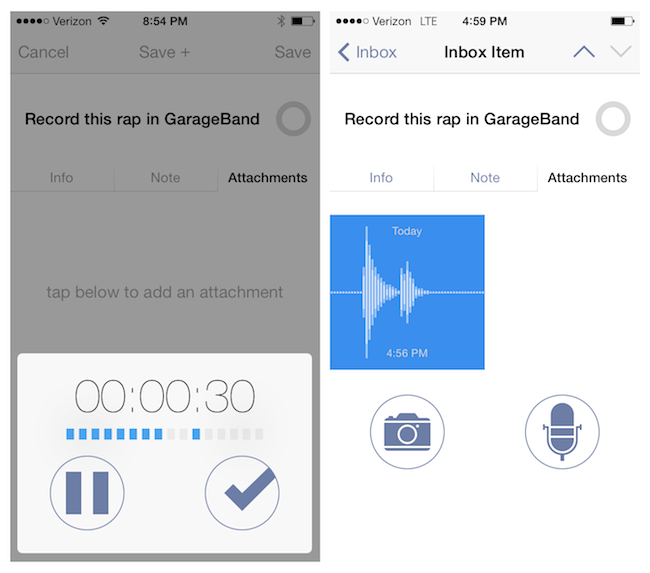 OmniFocus 2 is being released as new app for all customers but is still highly recommended. 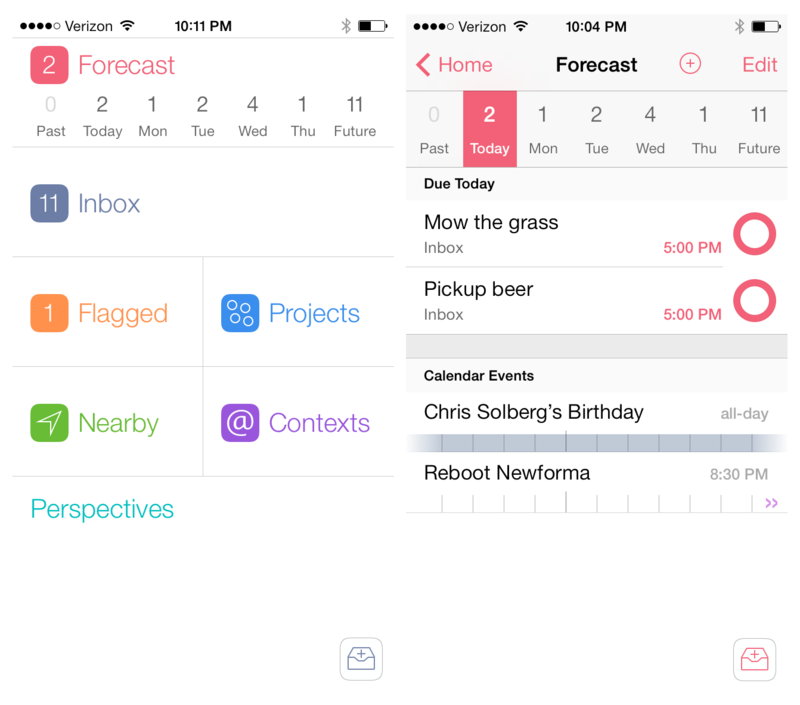 OmniFocus 2 for the iPhone is available on the App Store for $19.99.